This made the world of difference between pregnancy #1 and pregnancy #2 (read more about my lack of morning sickness with baby #2). I was throwing up until 22 weeks with my first pregnancy and was so miserable. With my second, I was taking a really good vitamin before I even knew I was pregnant, and I hardly had any sickness at all (both girls). I have since heard various vitamin deficiencies can cause morning sickness, so this makes sense. My particular vitamins had a good source of B vitamins, milk thistle, and even ginger and peppermint (great for the tummy). Once you are for sure pregnant, you will want to make sure you are taking the appropriate amount of folic acid as well. 2. Find out what baby products you really need. My friend accomplished this in the most amazing way! She started a baby registry on Amazon, and then sent family and friends an invite to add items to the list that they felt were life savers or must-haves. After everyone made their suggestions, she had an incredible list of very specific items (and brands) that came highly recommended by those she trusted. She then narrowed down her list to what she needed/wanted. SO SMART! I remember doing my registry and registering for the most random things because I had no idea what I was doing! If you are starting your registry from scratch and need some good suggestions to start out with, here is a good list of Baby must-have products, as well as the Nice-to-haves, and the ones that really aren’t necessary. I would also highly suggest that you sign up for an Ebates account if you don’t already have one. Especially if you will be buying a crib and other nursery items. Ebates give you cash back for your online purchases, and it adds up really fast when you are buying a bunch of baby gear! We got over $10 cash back just on our crib! Don’t forget to install the Ebates Bookmark Button on your toolbar. It will automatically tell you when you are shopping on a site that qualifies for rebates so you can activate it! You may or may not be fond of an expanding belly, depending on who you are, but take pictures anyway! I took various “belly shots” throughout my pregnancy, but I totally forgot to take one right when I found out I was pregnant, and again right before I delivered. I wish I would have. It would have been cool to see the difference! 5. Start working on some projects that will fuel our excitement and help pass the time. I remember checking my pregnancy app EVERY. SINGLE. WEEK. to see what size my little fetus was and what the latest developments were. I was so excited I would read ahead several weeks. If you find you have some time on your hands, put it to good use and start making some things for your new arrival. Here is a great post that features DIY Baby Projects for each week you are pregnant. 6. Tell Whoever You Want. 7. Try to Eat Healthy. 8. Implement an EASY exercise program. Yes, it’s important to exercise when you are pregnant, but if your goal is too lofty you will err on the side of doing nothing at all, especially if you are sick and tired. Make a goal to at least stretch and stay somewhat flexible so that you are more comfortable in the 3rd trimester (and for labor). With my first pregnancy, I had the goal to run 5k’s throughout my pregnancy. HA! yeah right. Remember how I said I was throwing up until my 22nd week? I didn’t move from the couch many weeks, and pretty much gave up on any type of exercise. I wish I had at least done a few simple things, especially in the 2nd trimester! Swimming is a great one if you know how, otherwise…check with your local gym and see if they offer prenatal yoga! Here is an article about the 1 thing I would do differently after 6 pregnancies! HINT – It has to do with exercising. 9. Stock up on diapers. My husband made fun of me for buying diapers before my baby was even born, but I watched for deals and got them SUPER cheap. One week I got them for $2.50/package, and practically cleared the store shelves! Although it took a good $100 or more of our budget (ouch! ), it saved us SO MUCH money that first year (we never had to buy diapers)! This brings me to item #10..
10. Sign up for Amazon MOM! Amazon mom is free and it rocks. You can get 20% off diapers, and if this is your first time signing up, you can get a free 30-day trial. 11. Sign up for Zulily. If you don’t have an account yet, sign up here. Not only do they have great deals on any kind of baby gear you can imagine, but they feature different maternity clothes every single day. This is where I bought the majority of my maternity clothes because I had a hard time finding anything cute locally (sometimes I found some stuff on Jane too, but Zulilly has a bigger selection). I rarely sign up for email updates, but if you are pregnant, this is one you will want to get an email from! If you already have an account, see what today’s deals are in the maternity and baby category. When I first heard of the Owlet, my first thought was, “Another baby product no one needs.” Until my friend had a really scary experience with her baby and was alerted by her Owlet. Now it’s my #1 recommendation for new moms. It’s a baby heart rate monitor that monitors your baby’s heart rate and oxygen while they sleep and alerts you if your baby has abnormal levels. I know this list was technically supposed to be 10 things, but over time I’ve had to add a few more that I thought were important like Take time for YOU! This is the last time you will be “just you” for a long time (ESPECIALLY if you are nursing that first year)! Go on dates with your husband, leave the house on the spur of the moment, and eat some ice cream silently on the back porch while your next door neighbor glances over in jealousy! 13. Check Out Our Ultimate Guide to Pregnancy. 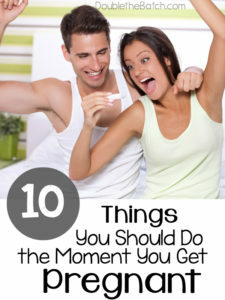 Tons of tips and ideas for your entire pregnancy! This article was originally written in July of 2015. It has been updated and edited in June of 2018.